How to Install Atom on Ubuntu 16.04 LTS? Atom is an open-source code editor which is widely used by software developers. Developers call it a "hackable text editor for the 21st century". It is cross-platform and supports dozens of programming languages. It was designed & developed by GitHub Inc and first released on February, 2014. 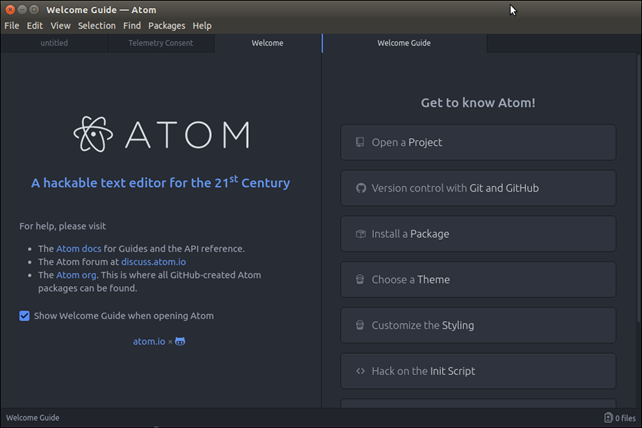 In this tutorial, we will install Atom on Ubuntu operating system. This installation process includes the following steps. Visit official site https://atom.io and download archive. Open terminal and enter this command. After installing, enter following command to open Atom editor. It will open editor that looks like the below. Well, we have successfully installed Atom in our system. Now, we can code in any programming language with our favorite code editor.